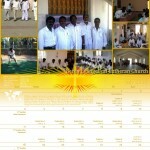 Pastor Ude distributed them to our India brothers. I gave them out to Johannesburg and Congo men. Pastor Ude will give them in Nigeria, Togo and Ghana during his visit. Pastor Mayhew will give them out in Tanzania and Kenya during his visit. Our brothers in Nepal and Myanmar can let me know how many copies they need for their leaders and I will give them during our Joint Leaders Meeting Oct. 1-2 in Nellore, India. Anyone on this mailing list is welcome to send an email requesting a calendar to Mary Koenig dnmkoenig [at] yahoo [dot] com and she will mail out a gift calendar. It doesn’t matter who or where you are, we will be glad to send this to you. Just make sure you let us know the mailing address. 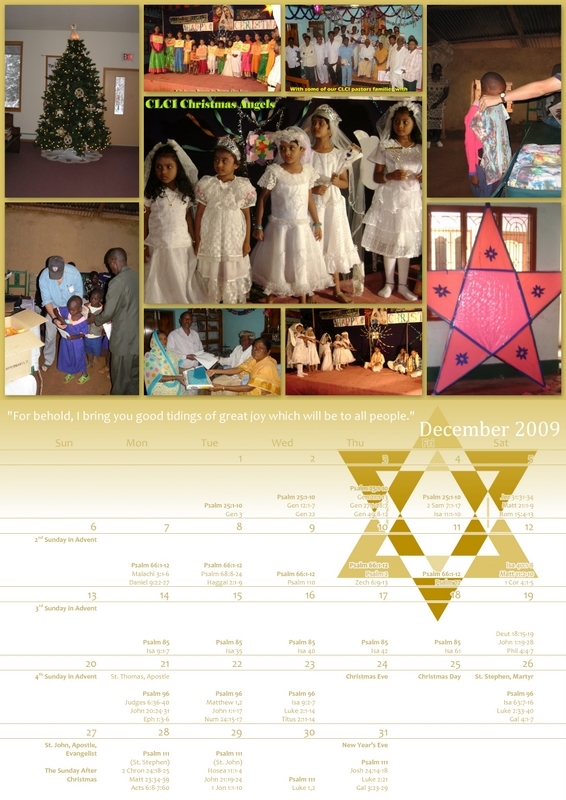 There is a sample of the calendars in attachment form. 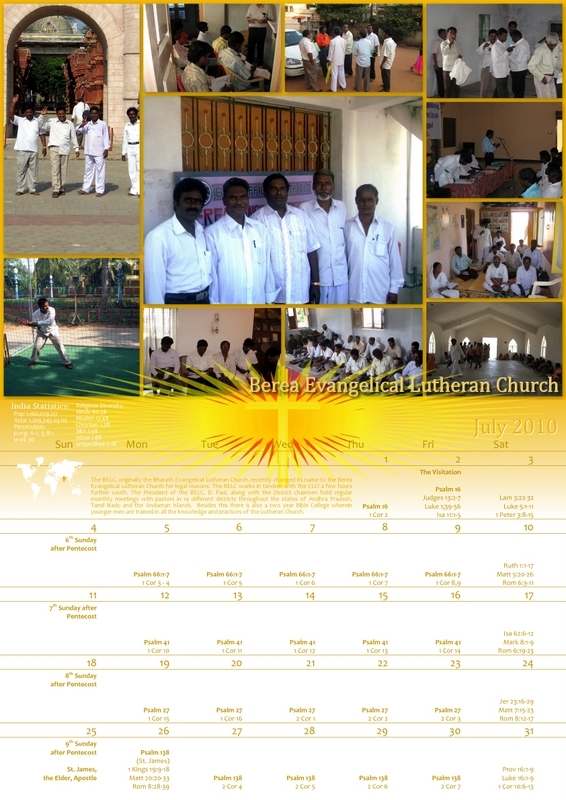 At the end of July eleven Mission Helpers returned to the USA from India after teaching in congregations and among pastors for two weeks. They worked with the CLCI and the BELC. Pastor Koenig was with the brothers in Johannesburg and the Democratic Republic of Congo over two weeks at the end of August. Pastor Ude with be with the brothers in Nigeria beginning Nov. 2nd and with those in Ghana and Togo beginning Nov. 30th. He will be back in India Dec. 7th. Pastors Bohde and Koenig will be in Myanmar for two weeks beginning Nov. 11th to visit with the brethren in the CLCM. There is an upcoming yearly trip by Pastors Ohlmann and Ude to Nepal to be with the HCLCN. We apologize for having the same passages of A PASSAGE EXPLAINED in B.A.S.I.C 149 and also in B.A.S.I.C. 151. Looking back in chapter fifteen it is about Christ’s resurrection from the dead. Christ is the first fruits of the dead v.20. As Christ rises, so all believers rise to life eternal. When we are baptized, often one is given the name of a believer who has gone before. In India it is often the name of a believer from the Bible. We are baptized into Christ’s death. Rom. 6:3-4 Taking the name of a believer shows the union we have with them in Christ. This passage first of all refers to Christ and secondly to all who are in Him. “Yet woman will be saved through bearing children, if she continues in faith and love and holiness, with modesty.” Paul had just explained about the position of women in the church that they are not to usurp authority over men. In this passage he explains the role of Christian women, one which men cannot fulfill, bearing children. The idea of a woman being saved is not by having children, but by faith. This is clearly stated in Scripture over and over again. Eph. 2:8-9 And it is stated in this verse also, “if she continues in faith…” As she continues in faith, modesty, love and holiness she is fulfilling her role as a wife and mother, a helper fit for her husband. Think of a parallel construction, Acts 14:22, “…through many tribulations we must enter the kingdom of God.” We enter the kingdom by faith. But part and parcel with faith is facing tribulations because of our faith. 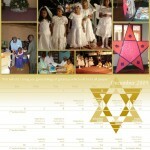 Attachment of a sample of the calendar.